I rather dislike the fact that in Crystal his motivations are more along the lines of “I need her for my science project” rather than actually trying to save her life as in the original anime. I know that it’s truer to the manga, but it was a motivational nuance that I felt really set Tomoe apart from all the other Big Bads of the series. In the original anime it always felt like he was an experimenter forced to make a deal with devil to save the one he loved. It is interesting to note (if the subs are accurate) that in Crystal, Tomoe seems to be shocked that the Daimon Egg in Hotaru actually was viable. However it was less a shock of dismay as opposed to “ooh, that’s interesting!” which is in keeping with his now total Mad Scientist approach. While I can see where they’re going with the mad scientist approach (and it definitely is in line with what Ms. Takeuchi did in the manga), I agree here that I think the original anime did a better job of making him a more dynamic character. There’s something about the “I’m just evil / crazy / etc. !” type of villain that feels a little too… two-dimensional to me. Would it hurt for him to have been not only interested in keeping Hotaru alive as a matter of furthering his scientific advances, but also because he loved her? I don’t think so. Tomoe suffered from a problem pretty much every other antagonist in the source material did. Underdevelopment, and paper-thin motivations. That being said I thought it was a bit of a shame, that like the Ayakashi sisters the anime just kind of forgot about him. The only plausible theory I can come up with, is that the death of his wife messed him up psychologically and ended up loosing touch with reality as a result. Like you mentioned, I always kinda just assumed that the loss of his wife basically destroyed the guy, but when you consider that he was doing these bizarre experiments in the first place, I’m not so sure how I feel about that theory. There’s also the fact that he just uses his own daughter (his only remaining family!) so blatantly. Sailor Moon is one of those unique series where the sub-enemies are 90% of the time actually far more developed than the main/head antagonist that the heroes fight against. While you spend so much time learning about Eudial and the rest of the Witches 5, you know virtually nothing about Professor Tomoe. The Ayakashi Sisters have their own motivations (even if not too clearly defined) while Wiseman is… umm… evil. I guess Sailor Galaxia is a bit of an exception, but Stars is kinda flipped around in general, so not sure how much that counts. 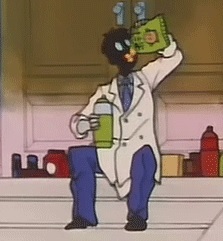 Big bosses in Sailor Moon were usually some kind of bad energy, not actual people. Beryl in the anime always felt like future body donor for Metalia and not a human being. Wiseman too. And Chaos is completly abstract concept. Same with Pharaoh 90, I guess. I agree totally with you on the Beryl/Metalia thing, especially when you consider the last episode of Sailor Moon Classic when they come together as one. I know it’ll never happen, but I’d absolutely love to see the story behind how the Four Kings and Beryl had re-awakened after being reborn. I’ve always been interested in how the dynamics of the Dark Kingdom since they kinda parallel the Sailor Soldiers. I can’t help but think of prof. Tomoe in the same way as dr. Drevis, Aya’s father, in Mad Father; as in, what if the wife opposed using Hotaru in these experiments from the start, and she generally balanced out the professor’s somewhat unorthodox and amoral nature? And then when she died, all boundaries regarding his daughter just disappeared? He could’ve actually loved his wife and respected her wish somewhat, but when she disappeared, so did the reason for him to upkeep the last shred of any morals. These things would’ve been interesting to explore as characterization and Hotaru’s family history. You know, it’s funny… there are actually quite a few villains in BSSM (I’m looking at you, Beryl) that don’t have any sort of strong motivation for being evil and it doesn’t really bother me. After all, there wasn’t really a lot of meat behind Dr. Claw’s obsession for trying to “get you next time, Gadget.” But I’m okay with that – heroes need antagonists. But in the case of Professor Tomoe, it’s all the more annoying that he’s so one-dimensionally evil precisely because Hotaru is his daughter. 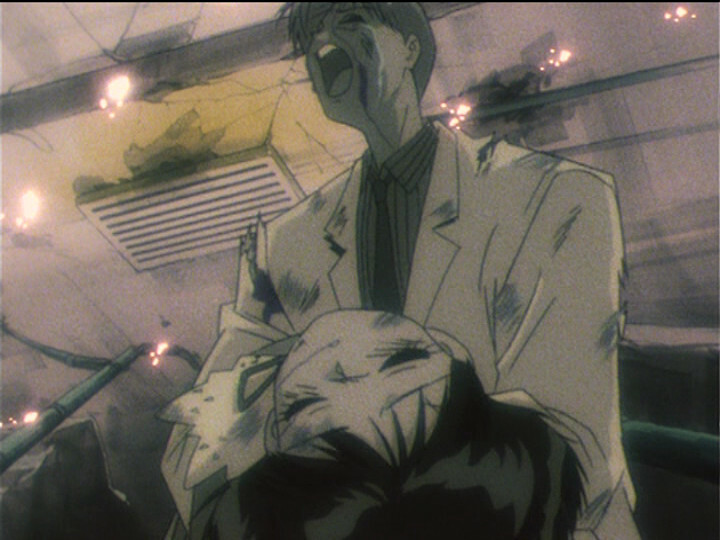 Especially since the Death Busters fall immediately after the Black Moon arc, which was centered around the mother/daughter combo of Usagi and ChibiUsa, and is contrasted with all the “good-dad” Mamoru scenes in Death Busters, it seems a little dismissive. If I’m not remembering incorrectly, somewhere in the last couple episodes of Crystal, Saturn tells Pluto to “close the door” after she (Saturn) follows the banished Pharoah 90 through it. Pluto calls upon Chronos, the father of time. I assume this is not the same Cronus we are talking about here, but that is what reminded me. Is this the only time we see any Senshi call upon any sort of “higher power” or god/goddess beyond Neo-Queen Serenity? Does Pluto also do it when she stops time and then dies? Perhaps an article on the significance of that would be in order. I mean, there are some things I like about the manga (the much clearer revelation about who the Shitennou used to be, or the thing about their ghosts), and the manga being the basic template for everything else to stem from (the seeds the flowers grew from, as I see it), reading the manga AFTER the anime makes it so hard to appreciate the manga. 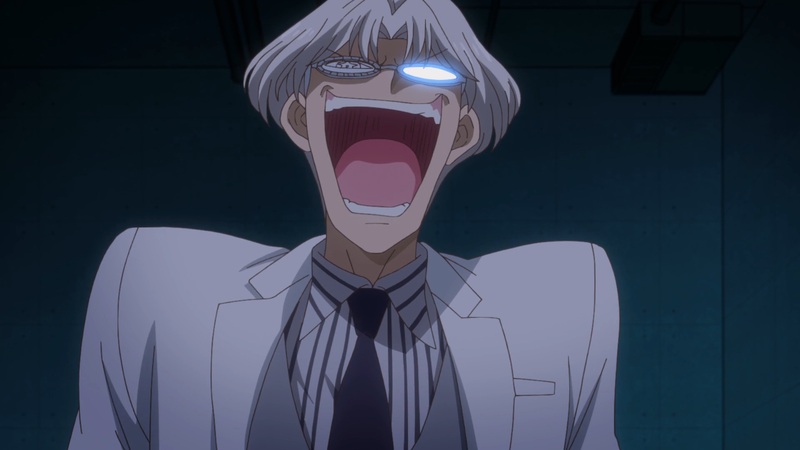 The characterization is just so much better on almost every villain/”miniboss” character in the anime, and Professor Tomoe is one of the most shining examples. I absolutely love Anime Tomoe. Manga Tomoe, not so much.